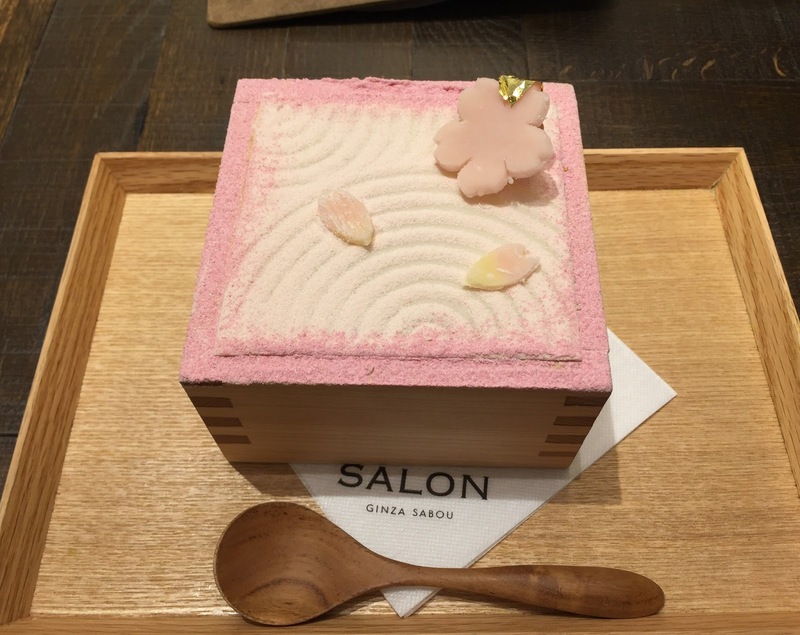 A while ago, I saw interesting sweets on Instagram that looked like Japanese garden, and I found out it's served at Salon Ginza Sabou in Tokyu Plaza Ginza. It's a Japanese restaurant run by a fashion brand Adam et Rope, and they serve both savory and sweets, also have to-go items. I decided to visit this spot right after the building opens, and I got to the outside around 10:45 AM. 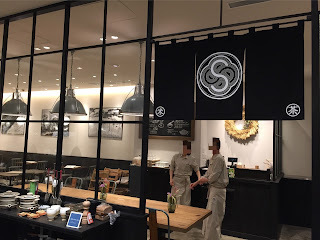 However, I only saw a not-moving-yet escalators that go to the 2nd floor so that I asked a group in front of me if they knew how to get to the basement floor as Salon Ginza Sabou is located on B2 floor. And they kindly showed me the way how to go down and also said the basement is already accessible. When I went down to the B2 floor, it's easy to spot and no one was there yet at 10:50 AM, and I asked a staff where to line up and another staff came and told me to stand towards the right side of the shop. You can line up at the black taped area. A group behind me was 4 females and they nicely let me stand first as they saw me asking the staff earlier. We talked until the opening hour, 11 AM, and we sat at next tables. There're many choices of savory menus and they all looked good. 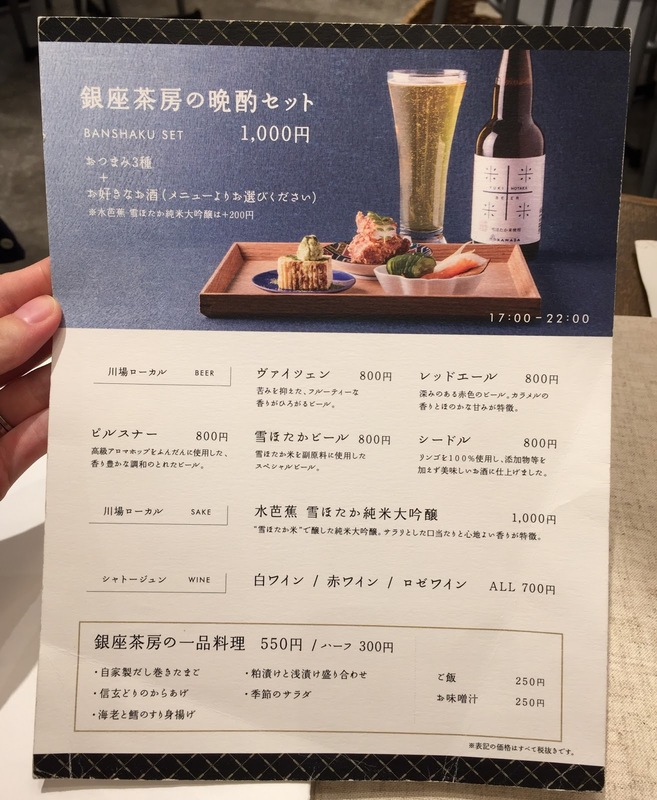 When I was looking at the HP before coming back to Japan, I learned that they have a limited time menu "Sabou Parfait -Sakura-" from March 15 and I got this item. The glass was short and the height was about the same as my fist. 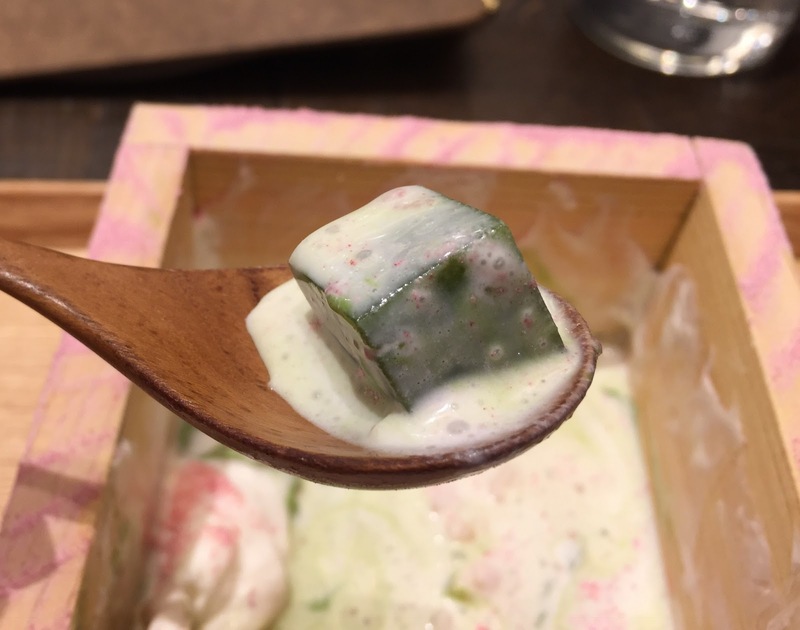 It's a Sakura version to celebrate the 1st anniversary of "Sabou Parfait" which is matcha flavor, and the appearance evokes Japanese gardens with delicate and artistic decoration. 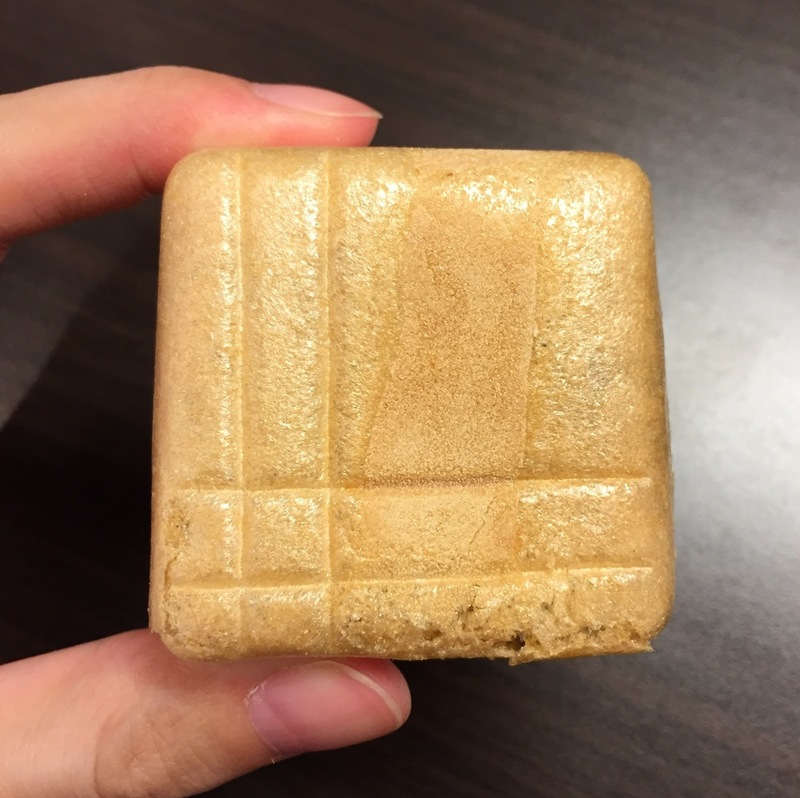 They use Japanese ingredients like Kuri-no-Shibukawa-ni (栗の渋皮煮, a sweetened chestnut with astringent skins on) and Warabimochi, and also rice puff and white chocolate, which are western items. I have no idea what these Sakura petals were made from, but the pink ball under the gold leaf was Sakura flavored white bean jam. It looked like a Karesansui (枯山水, dry-landscape) garden. To eat, I had to break the top which was made of white chocolate. It's a shame to destroy such a beautiful decoration, but I crushed it. Right under the thin chocolate plate, there're runny cream and rice puffs. The white chocolate was crunchy, the great was light, rice puffs were crispy and the sakura colored powder had subtle saltiness. At the bottom, I saw matcha colored layer and there's anko, sweet red bean jam. The matcha at the bottom was silky and similar to very soft pudding, it's so smooth and had rich matcha flavor. 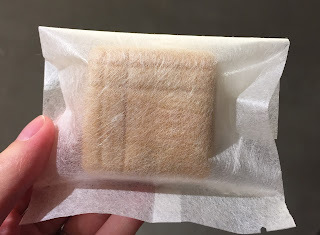 There's something chewy that I thought Gyuhi (求肥, Turkish delight), but it could have been Warabimochi, bracken starch dumpling. A half of chestnut with astringent skins was found. When I could put matcha base, sweet red bean jam, cream and rice puff all together with some Sakura powder, it's heavily good and such a interesting combination of Japanese and western ingredients. 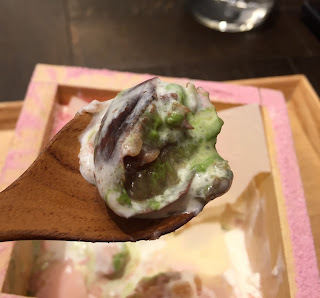 Matcha flavored jelly and melted Sakura flavored ice cream. Masu (枡, a wooden square box) was much larger than I thought, like 12cm x 12cm (4.72 inch), but the parfait was light and not too sweet with various flavors and textures while having creamy texture so that I could eat it all without any problems. * Monaka (最中) is a wagashi/Japanese sweet that has sweet red bean jam between thin crispy wafers made from mochi. 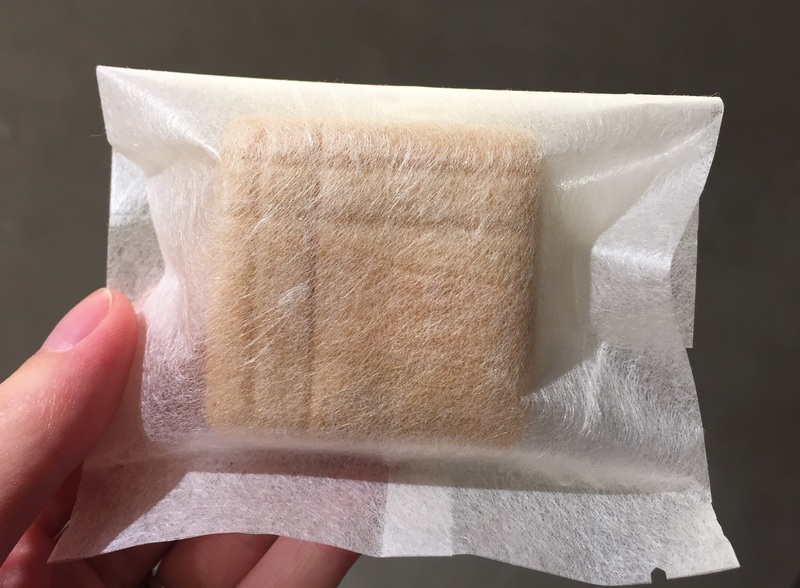 My pocket wifi didn't have any signal at the B2 floor but I connected to the free wifi provided by Tokyu Plaza Ginza, posted the photo, showed to a staff and got this Monaka. On the back, it says "chocolate snack" but sure contains both smashed and strained red bean paste. 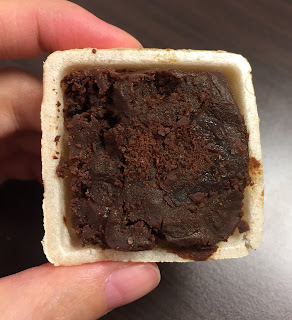 The filling seemed to only have chocolate but once I ate it, I tasted mashed and strained sweet red bean jam. 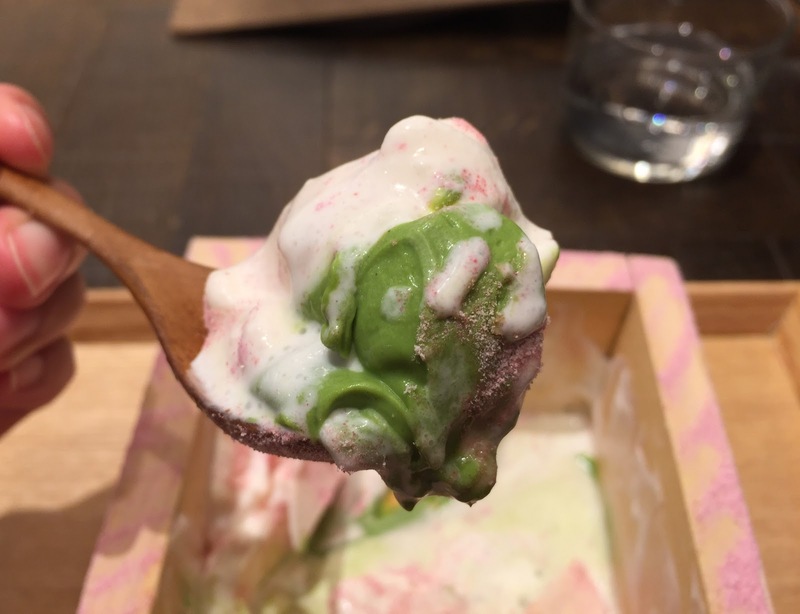 I'd like to try savory dishes next time besides the matcha parfait.